When he discovered the cause of the bacterial disease puerperal fever (also known as “childbed fever”), Hungarian physician Ignaz Semmelweis (1818-1865) made possible the saving of millions of lives. During his own lifetime, however, while trying to get his medical breakthrough accepted, he faced an enormous amount of opposition. Not only was Semmelweis discredited by his colleagues and the medical authorities of the time, even his wife and close friends eventually began to distance themselves from him. Nevertheless, in the years following his death, his findings went on to replace the entrenched ideas of the scientific and medical establishment, eventually becoming fully accepted. 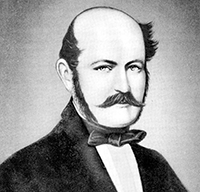 Semmelweis was born into a family of wealthy grocers. The fifth of ten children, as a young man he initially studied law before switching to medicine. Awarded his medical degree at the age of 26, he went on to work as an assistant to Professor Johann Klein in the First Obstetrical Clinic at the Vienna General Hospital. At that time, the clinic had an average maternal mortality rate for puerperal fever of around 10 percent. To the physicians of the time, it seemed that nothing could be done to reduce this death toll. The Vienna General hospital had two maternity clinics. Interestingly, with a mortality rate for puerperal fever of only 4 percent, the Second Clinic had a far lower number of deaths than the First Clinic. Not surprisingly, therefore, because of the poor reputation of the First Clinic, women begged to be admitted into the Second Clinic. In desperation, some even preferred to give birth in the streets. Statistics showed that these women, too, only rarely developed puerperal fever. But nobody knew why. So Semmelweis began to investigate. To me, it appeared logical that patients who experienced street births would become ill at least as frequently as those who delivered in the clinic. […] What protected those who delivered outside the clinic from these destructive unknown endemic influences? Semmelweis tried to figure out what the main difference was between the two clinics. He eventually came to the conclusion that the only clear difference was in the staff who worked there: the First Clinic served as the teaching service for medical students, while the Second Clinic was used to instruct midwives. But there was still no clear reason as to why one had a higher death rate than the other. An unfortunate incident in 1847 led Semmelweis to the answer. His friend Jakob Kolletschka was accidentally poked by a scalpel during a postmortem examination and died shortly thereafter. Kolletschka’s autopsy showed a pathology similar to that of the women who died from puerperal fever. Semmelweis realized there was a clear link between contact with corpses and the development of puerperal fever. He concluded that doctors in the First Clinic were carrying cadaverous particles on their hands and passing them on to the pregnant women they examined. Semmelweis therefore made it a rule that everyone had to disinfect their hands with a solution of chlorinated lime when moving between autopsy work and examining patients. As a result, the mortality rate in the First Clinic decreased rapidly. The cause for puerperal fever was thus revealed to be a lack of proper hygiene. You might imagine that after this medical breakthrough Semmelweis would be celebrated and treated as a hero. But you’d be wrong. His findings were largely either ignored, rejected, or ridiculed. Eventually, he even lost his job. Frustrated, Semmelweis left Vienna and moved to Pest (known today as Budapest). Here in 1857 he married Maria Weidenhoffer, the daughter of a successful merchant. While Semmelweis’ findings were being ignored in Hungary, there were at least some encouraging signs that his ideas were gaining acceptance elsewhere. He was quite favorably received in the United Kingdom, for example. W. Tyler Smith, an English obstetrician and medical writer, said that Semmelweis had “made out very conclusively” that “miasms derived from the dissecting room” could cause puerperal fever. Most medical lecture halls continue to resound with lectures on epidemic childbed fever and with discourses against my theories. […] In published medical works my teachings are either ignored or attacked. The medical faculty at Würzburg awarded a prize to a monograph written in 1859 in which my teachings were rejected. In general, the reaction to Semmelweis’ work was mostly negative. So much so that even the celebrated scientist Rudolf Virchow rejected it completely. Virchow had enormous influence in medical circles at that time. If he discredited a new idea, its chances of gaining acceptance would inevitably be reduced. 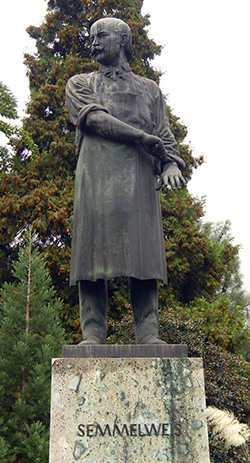 Ede Flórián Birly, Semmelweis’ predecessor at the University of Pest, similarly refused to accept the medical breakthrough. Instead, he continued to believe that puerperal fever was somehow due to uncleanliness of the bowel. As a result, the years Semmelweis spent fighting against his critics inevitably left their mark on his health. By 1861 he was suffering a variety of nervous complaints, including severe depression and absentmindedness. Paintings between 1857 and 1864 illustrate he was also aging rapidly. 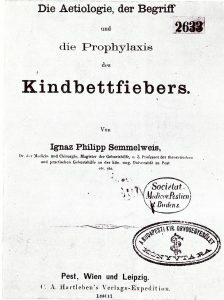 It is said that in every conversation Sammelweis quickly turned to the topic of childbed fever. 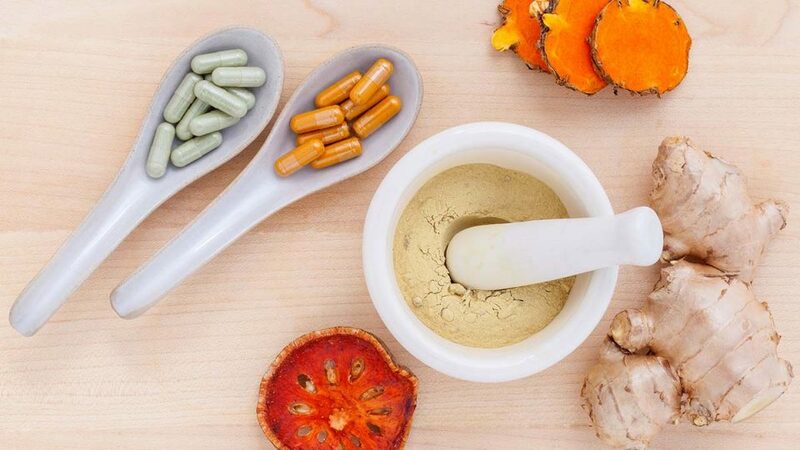 And yet, in the same letters he also tried to build bridges by calling upon Eduard Casper Jacob von Siebold, a German professor of gynecology, to arrange a symposium in order to provide a forum for discussions on puerperal fever. By mid-1865 Semmelweis’ public behavior had reportedly become irritating and embarrassing to his associates. He also began to drink immoderately. Semmelweis then suffered rapid cognitive decline and mood changes. It may have been emotional exhaustion, or perhaps a form of syphilis or dementia. At the end of July 1865, at the age of just 47, he was admitted to an asylum for the insane where he was severely beaten, tied into a straitjacket, and confined to a darkened cell. He died two weeks later from a gangrenous wound, almost certainly resulting from the beating he received. Semmelweis was buried in Vienna on August 15, 1865. Only a few people attended the service. Short announcements about his death appeared in a few medical periodicals in Budapest and Vienna. Meanwhile, despite it now being largely preventable, women continued to die from puerperal fever. Semmelweis’ discovery was finally implemented into standard medical practice in the late nineteenth century. Had his advice about good hygiene been acted upon years earlier, rather than being attacked by the scientific and medical orthodoxy, many thousands more needless deaths could easily have been avoided.